Love this menswear look...I have tried it before and feel like I failed miserably...it ended up being really girlie looking, go figure. You have mastered it perfectly here...very adrogynous (sp?) but still beautiful and fem. thanks doll- this is fast becoming my fave trend!! that clutch and those stud bracelets are fantastic love!! Ahh I love the blazer! I am seriously STILL trying to find the perfect one. I need to hit up a thrift shop. I bet that's where all the goodies are hiding!! haha. and i am the total opposite, i feel completely natural smiling (normally b/c i'm talking and laughing with whoever is taking my pics) and feel silly when i try to look serious. i love the shorts and blazer look. I love your blazer! I really love menswear inspired looks. that purse is FAB! Love this outfit and awesome spiked bracelet! You have such a very cute style I love your blog now following!! Thanx for your comment on mine! You look totally great smiling:) I think I look so mean when I don't smile that I don't think I could ever NOT smile! Funny, I'm wearing shorts and a blazer today, too! Great minds thinking alike? I love this look! I'm so obsessed with menswear recently. You look great. I'm also one of those people who never smile. I just look incredibly awkward. beautiful blazer!great outfit.i am following you cos i really like your style and your blog is very nice.follow back if u want dear. I love how you combined the boyfriend style with leopard shoes. Great! @pancakeStacker: that's where they all are- seriously! This one was $4.50!!! @Simply Chic: yes, but you look beautiful and natural when you smile dear! @Anonymous: oh where have you been all my life- hope your well lady!! I too never smile and just noticed now that you mentioned it in your pictures.. Haha,, I love women who are daring and wear menswear or take inspiration from mens clothing! Looks awesome! Love the color on your nails! And rock that smile girl, it's gorgeous! That blazer looks cute with the pink shorts. It's a great mix of masculine and feminine. 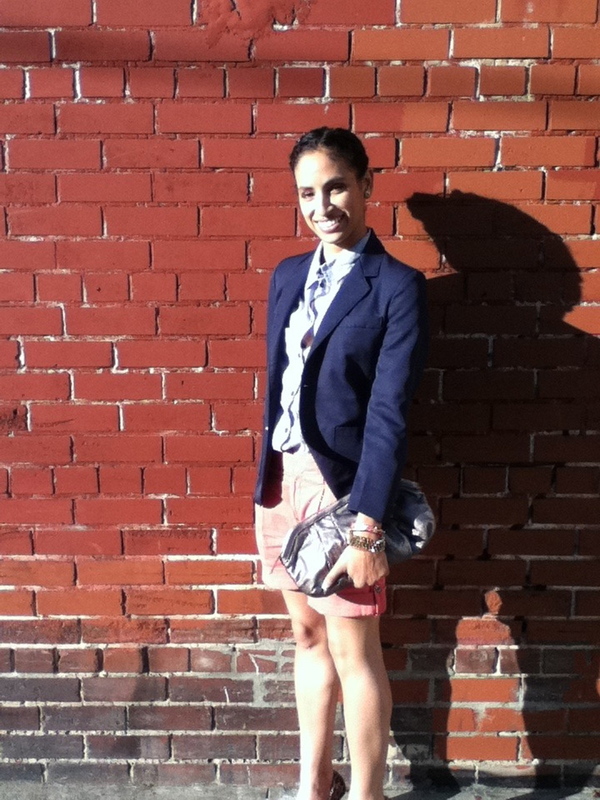 Love this entire look, the blazer, the shorts, the clutch.. nicely done!